1924. 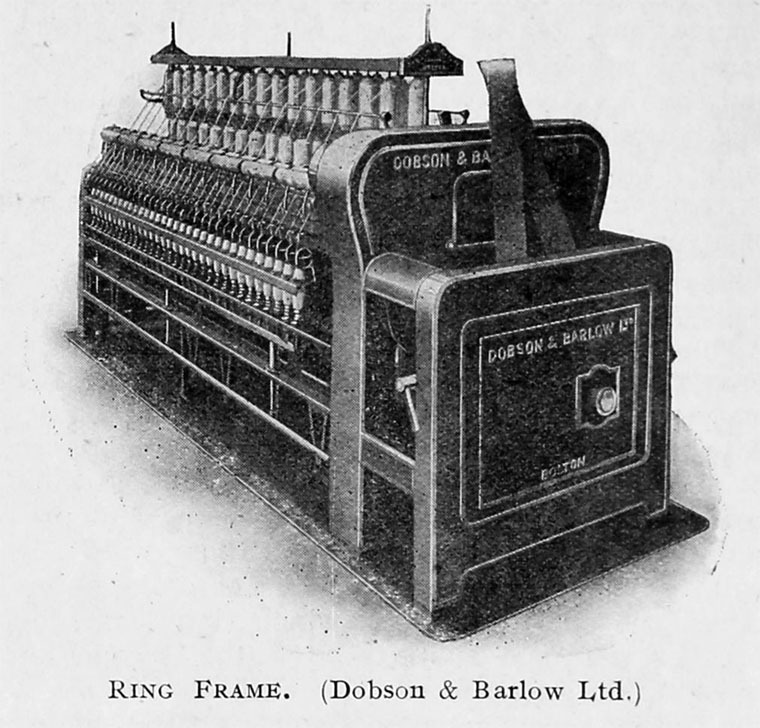 Dobson and Barlow Ring Frame. 1924. 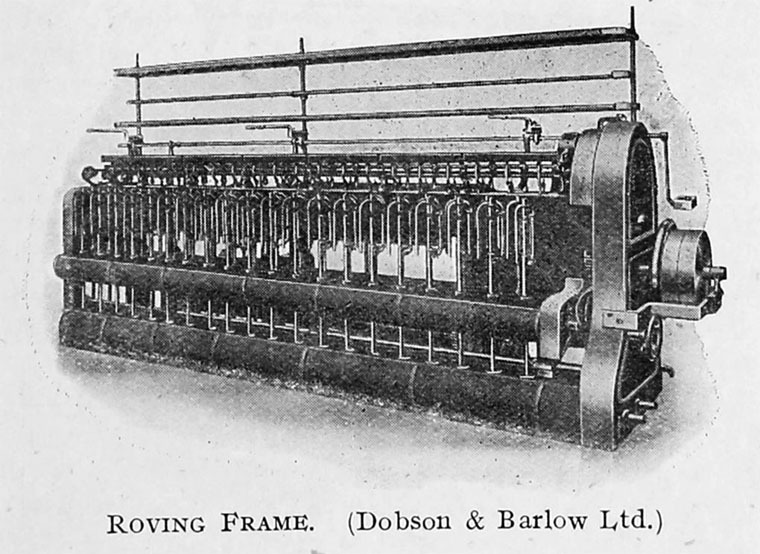 Dobson and Barlow Roving Frame. 1851 On the death of Mr. Metcalf, Benjamin Dobson entered into partnership with Mr. Barlow; the name of the firm became Dobson and Barlow. 1864 Patent to Peter Knowles, Foreman in the employ of Messrs. Dobson and Barlow, of Bolton-le-Moors, in the county of Lancaster, Machine Makers, for an invention of "improvements in machinery for opening and cleaning cotton, and other fibrous materials." 1873 Description of the works. Area 40,000 square yards, about 2000 employees. The main chimney was 367 ft high, contained nearly a million bricks, with 120 tons of stonework on the top. The foundry produced 150-160 tons of dressed castings per week. They produced about 14,000 mule spindles and 1000 throstle spindles weekly. Late 1880s, producing between 600 and 650 looms a year. 1892 The firm became a limited liability company. 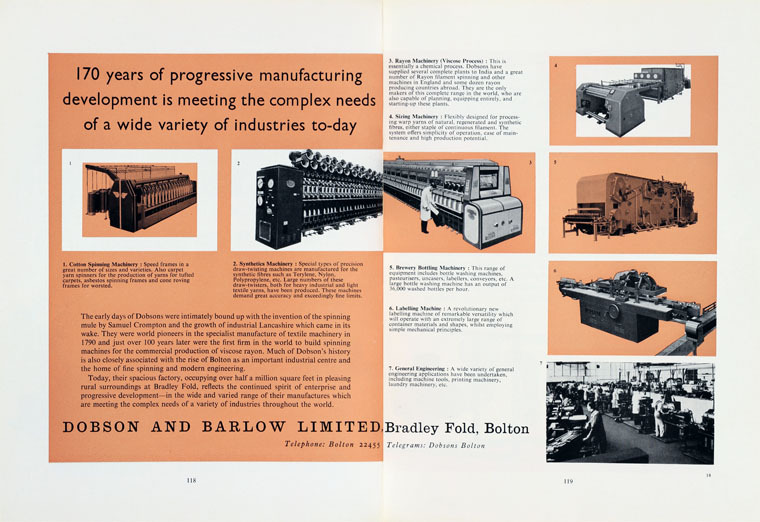 1906 After building a second production facility at Bradley Fold, the company was re-floated as a public limited concern with members of the Dobson family holding key directorships. 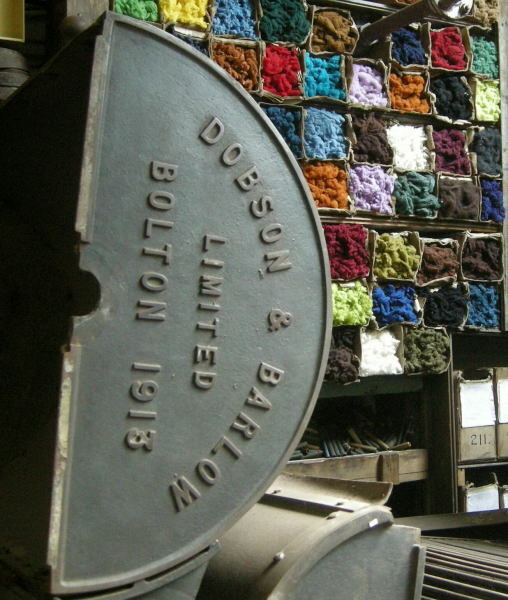 Dobson and Barlow's main competitors between 1890 and 1913 were mainly Lancashire based companies such as Platt Brothers, Asa Lees and Co and Howard and Bullough. Between them these three companies alone employed around 20,000 workers. 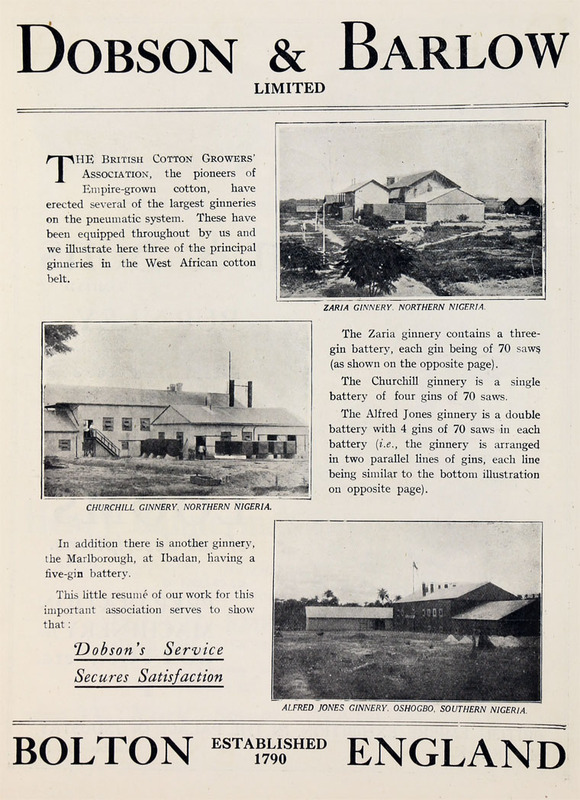 WWI During the First World War Dobson and Barlow Ltd became one of the most important producers of munitions in the region. They produced a wide range of war equipment including Mills No. 5 hand grenades, artillery shells, field kitchens, mobile workshops, naval mines and search lights. Apart from the significant disruption to their normal activities caused by munitions production, some 1,600 male employees volunteered for the armed forces. 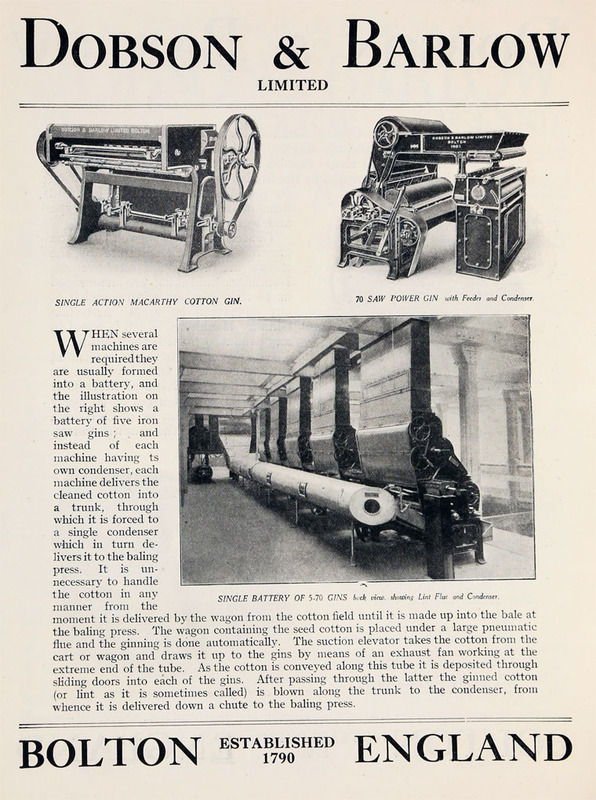 1915-1918 Dobson and Barlow withdrew from the textile machinery market to concentrate on munitions. 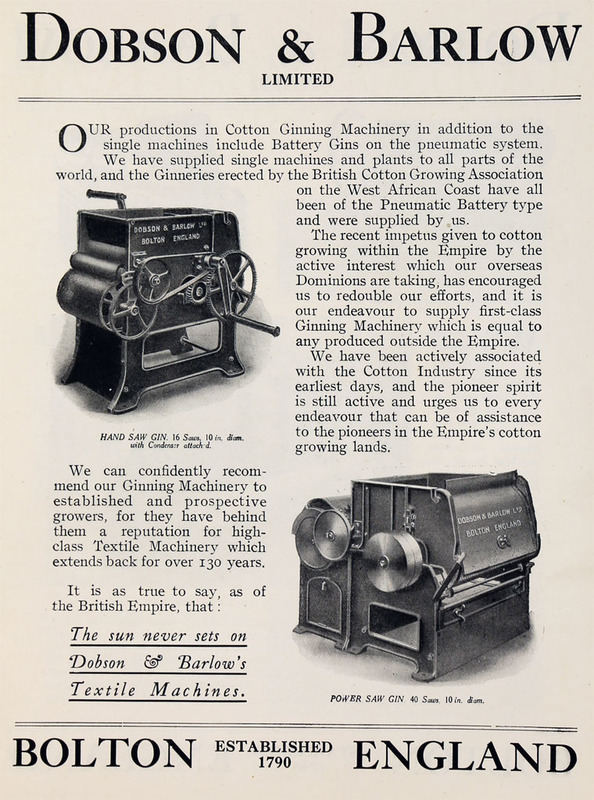 1981-21 Company records indicate that a large proportion of the orders received between 1918 and 1921 were from Belgian and French textile producers who were re-equipping and refurbishing after the devastation of the war. 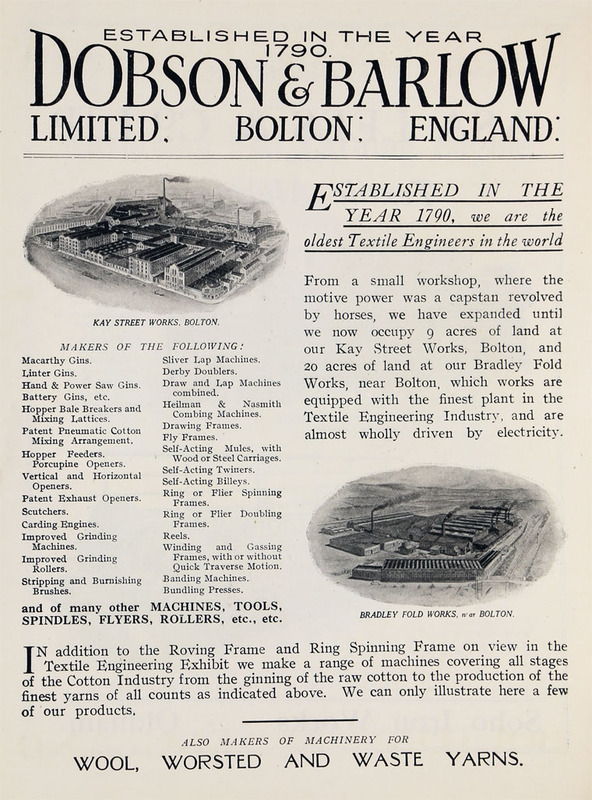 1932 Dobson and Barlow were incorporated into Textile Machinery Makers (TMM) and after then lost much of its independence. WWII: Dobson and Barlow produced bomber wings at the Bradley Fold plant. These units were totally unlike their normal production and were mostly hand built using mainly skilled male workers. By the end of the war the company had built 6,065 pairs of wings. 1979 as part of Platt Sacco Lowell, the Dobson and Barlow plant employed less than 200.